iPhone and iPod touch game vendors have released a slew of new games in recent days; here's a roundup of some of the ones that have caught our attention. Spoilage is IGG Software's introduction to the iPhone gaming market. The company describes it as a "chess-like strategy" game with "checkers-like moves." You're a bacteria colony battling for resources, and your job is to keep from being exploited by the competition. Spoilage costs $2.99. The classic 1980s-era Mac action game is back for the iPhone. Crystal Quest first appeared for the Mac in 1987. Now, 21 years later, you can play it on your portable Apple device. It's a space shooter in which you collect crystals and avoid the Nasties, enemies that emerge from portals on either side of the screen. You can fire weapons at them or deploy a smart bomb to vaporize all the Nasties on the screen as you collect all the crystals to open the gateway and go to the next level. Crystal Quest is priced at $4.99. 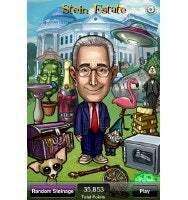 A trivia game featuring the droll, sleepy-eyed TV personality, political commentary, writer and attorney, Ben Stein: It's Trivial features more than 1,200 trivia questions, touch screen and shake controls, a "Bobble Head" Ben, tunes and memorable quotes, bonus and lightning rounds and unlockable prizes. Stein is indelibly etched in the minds of a generation of 80's teenagers who remember him as the bespectacled teacher in Ferris Bueller's Day Off: "Bueller? Bueller?" It's priced at $4.99. Newtoy's debut on the iPhone is Chess With Friends, a multiplayer game that lets you play chess against other players over EDGE, 3G or Wi-Fi services. You can play against friends or find a game automatically with a "Random Opponent" feature, pass and play to another person in the same room, and play on either an iPhone or an iPod touch. It costs $4.99. oeFun has released Cosmic One for free for a limited time. It's a puzzle game in which you capture falling tiles, then move the catcher with your thumb to match the symbol. It features an online leaderboard and space-themed ambient music score. Cavebear has released the $5.99 Jumble, a game in which you create teetering towers comprising kitchen hardware, toy soldiers, cupcakes, beanbags and other found objects. The game features more than 40 levels, two distinct game modes and multiple object types, high score recording and medals to win, and the ability to tilt to prevent collapse. A kinetic puzzle action game in the same vein as Zuma, Blackbeard's Assault costs $2.99. You need to remove colored cannonballs as they travel along a path by firing your cannon, filled with a ball of a specific color. As they come together the balls form a chain reaction, causing a cascade and run of points. Blackbeard's Assault features 20 levels, 3 difficulty modes, auto-save and resume, and a story mode involving Blackbeard's revenge on his father's killer. Python, available for $2.99, is a new twist on the classic game "Snake," in which you have to control a snake who continues to grow as he consumes prey. You use the accelerometer to control the snake, collect points and go to the next level. The game includes force feedback and unique graphics.